60% cotton/40% polyester 7.5 ounce printed fleece. Urban Woodland is sewn with 100% cotton thread. 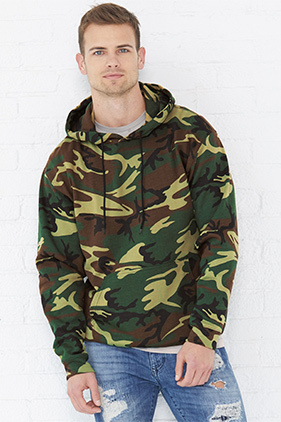 Fleece lined hood with drawstring. 2" 1x1 rib cuffs and bottom band. Coverstitched neck, shoulder, armholes, cuffs, hood, muff pocket and bottom band.